Ceregene develops products that are intended to substantially improve the symptoms of terrible, debilitating diseases of the brain and eyes, and for the first time ever slow, halt or possibly reverse their progression. Through the use of novel gene delivery technology, Ceregene has developed the means to deliver naturally occurring neurotrophic factors selectively to degenerating cells in the brain and eyes. These neurotrophic factors improve the function of these cells and enable them to regenerate, making them healthier, more functional and better able to withstand further degeneration. Ceregene’s approach offers new hope to those afflicted with neurodegenerative diseases such as Parkinson’s disease, Alzheimer’s disease, amyotrophic lateral sclerosis (ALS) and ocular diseases like retinitis pigmentosa, macular degeneration and glaucoma. Ceregene is focused on developing products that use naturally occurring neurotrophic factors that are normally responsible for maintaining the health of neurons in the brain and eyes. When delivered to the dying cells in patients with neurodegenerative diseases such as Parkinson’s disease, Alzheimer’s disease, ALS, and ocular diseases, these neurotrophic factors are able to restore function and vitality of these cells. Thus, these growth factors are capable of slowing, halting, and even reversing degeneration of cells in the brain and eyes. Because these factors are large proteins, they are extremely difficult to deliver to the target tissues using conventional means. Ceregene has developed the means to circumvent these delivery problems by using targeted gene transfer techniques. Ceregene accomplishes this by delivering the genes for these proteins to the affected sites in the brain or eyes, rather than attempting to deliver the proteins themselves. The genes then become permanently incorporated into the targeted cells and the cells produce the growth factors on a sustained and steady basis. A single treatment can thus provide prolonged, and perhaps permanent, therapeutic treatment. Ceregene’s approach differs substantially from all currently available therapeutic options which are designed to provide short-term, symptomatic treatment for degenerative diseases of the brain or eyes. These conventional treatment approaches are not intended to significantly improve the vitality of the dying neurons nor therefore alter the core disease process. For each disease Ceregene is treating, we have selected a specific neurotrophic factor that is known to enhance function and vitality of the cells most affected by the disease. We then target the delivery of the gene for that neurotrophic factor directly to the site where the cells are degenerating. Thus, Ceregene’s therapeutic approach not only offers the opportunity to reduce serious symptoms of these diseases, but also halt or even reverse cellular degeneration and thereby normalize function. Because neurotrophic factors are large proteins, they cannot be given orally nor can they even be injected intravenously for they do not have ready access to the brain or eye when administered using conventional drug delivery techniques. 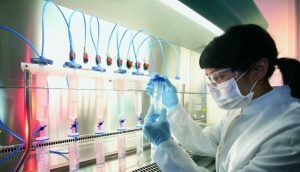 To overcome these problems and provide targeted treatment directed only to the affected cells, Ceregene has developed gene delivery technology that provides the means to deliver the gene that encodes one of these neurotrophic factors, so that following a single dosing procedure, long-lasting treatment of the disease is achieved. The gene for the neurotrophic factor would thereafter reside cells in the affected tissue, enabling these cells to produce the therapeutic neurotrophic factor indefinitely. Because of these invaluable advantages, gene transfer, as developed by Ceregene, provides the best hope for effective disease modifying treatments for these conditions. Ceregene has developed gene delivery vectors to target the expression of genes for neurotrophic factors to degenerating tissues. Using a highly modified and harmless version of adeno-associated virus (AAV), type 2 as the delivery vector, a single treatment provides prolonged production of the therapeutic factor directly to the targeted cells. This enables Ceregene to develop different products using different neurotrophic factors for Parkinson’s disease, Alzheimer’s disease, ALS (Lou Gehrig’s disease), and several blinding ocular diseases.